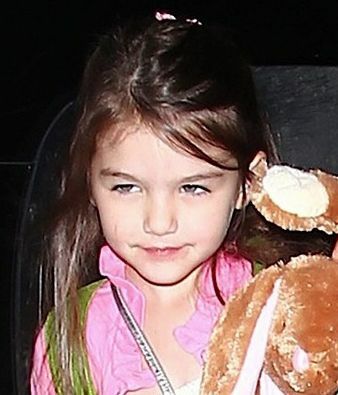 Suri along with TomKat spotted leaving Broadway Theater in NYC on Tuesday, 25. The Cruise Family watched "Come Fly Away" show. 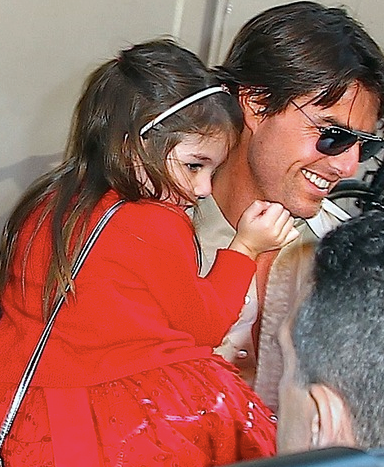 Suri is also wearing Cashmere Cardigan in Poppy by Bonpoint. jeweled headband (crewcuts), silver bow bag (seed) and silver dance-wear shoes (freedom of london). In the evening The Cruise Family enjoined a lovely dinner at Ristorante II Cantinori in NYC, though for desert Suri choose to visit Sundaes and Cones to pick up strawberry ice-cream. Suri layered her white dot dress with Ruffled Storytime Cardigan in Papaya by Crewcuts. 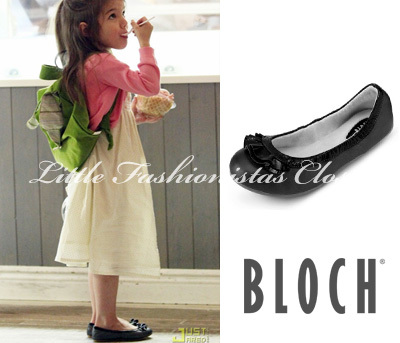 Suri switched up her shoes for the evening to a new pair of fabulous Carina Ballet Flats in Black by Bloch. tbh, i love these shoes! 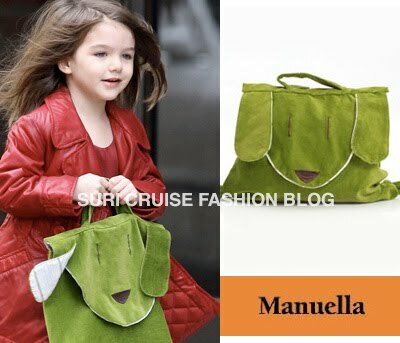 She is also carrying Green Doggy Backpack by Manuella, first seen in November 2009. 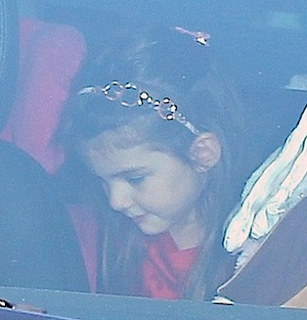 Suri & Katie spotted returning to their NY apartment on Monday, 24. Suri completed her outfit with new favorite Arabella Ballet Flats by Bloch, debuted yesterday and Bow Bag in Silver by SEED, she sported the gold version of this bow bag back in December 2009. Suri is wearing Silver Dot Midas Popsicle Dress from SS'10 Collection by ILoveGorgeous. Suri & Katie frist stopped off at one of their favorite eateries, Le Pain Quotidien, for coffee and some pastries to go; later their made a trip over to Barneys New York to do some shoe shopping on Sunday, 23. Suri is wearing Sunburst Printed Party Dress in White from Hamptons TG Collection by GAP. 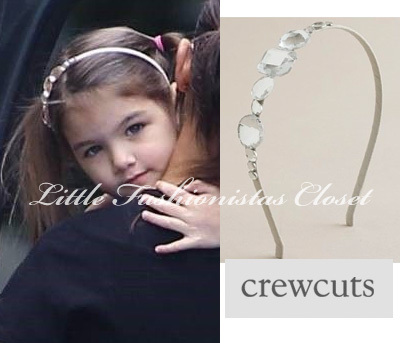 Suri accessorized her outfit with Multi-Jewel Headband in Crystal by Crewcuts. S&K wore matching Purple Ballet Flats. Suri is wearing Arabella Ballet Flats in Grape by Bloch. Katie is wearing Patent Ballerina Flats in Grape by Bloch. Suri & Katie went shopping to Steven Alan store in LA on Saturday, 8. Suri is wearing another one short-sleeves gown from Esme Loungewear, imho its too short and too thin to be considered as an appropriate piece of clothing to wear in public..
Suri is wearing Sereias Mermaid Flip Flops by Havaianas, while leaving hotel with TomKat in Rio de Janeiro on January 31th 2009. 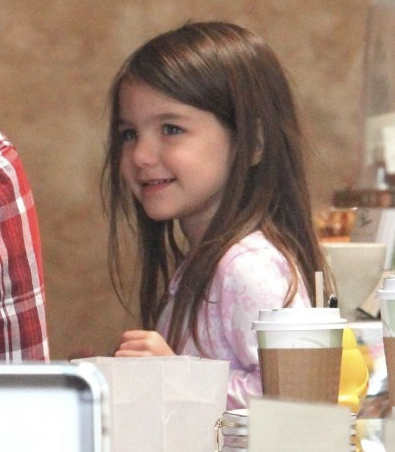 Suri & Katie pick up their lunch spot at Le Pain Quotidien, in Beverly Hills, CA on Monday, 3. Suri wore her favorite fuzzy pink piggy slippers and another nightgown in Lavender & Pink Cloud by Esme.